Pagan Pride South is a not-for-profit organisation that exists to promote paganism along the South Coast of England. For some people Paganism is a misunderstood voice. Our aim is to provide an accurate representation of pagan beliefs and help people appreciate pagan influence on our collective culture and heritage. In the celebration of diversity we can inform our communities, build bridges to overcome prejudice and engage in community projects. 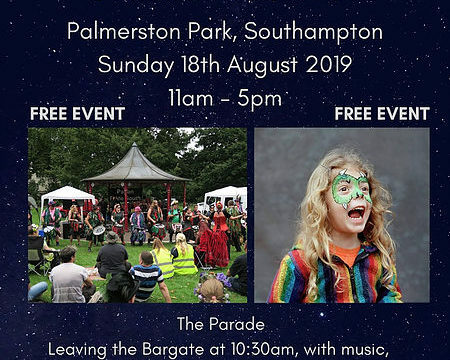 The Pagan Pride South parade 2019 will take place on Sunday 18th August. Starting from The Bargate, the parade will walk up through the centre of the city to New Road then walk down into Palmerston Park. The parade will be full, exciting and colourful with people drumming, chanting, dancing, laughing, singing and more. On arrival at Palmerston Park you will find a whole range of craft stalls, entertainment, workshops, talks, performers, dance area, info tent, food stalls, childrens area and so much more. This event is free and open to all.